Is that one of Marvel’s biggest villains hiding in plain sight? It’s been one of Marvel’s best-kept secrets. 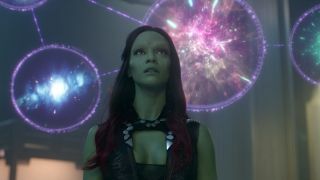 Since Guardians of the Galaxy, director James Gunn has teased the existence of a major Easter egg in the movie but, until now, no one’s got close to figuring it out. Key phrase: until now. Because it seems that one dedicated fan has put the pieces together and figured out the Easter egg – and it could have serious ramifications for the MCU-at-large. YouTuber Second Son (H/T CBR) has staked a claim on entering MCU fans’ folklore as he breaks down the scene, you know the one, where the Collector goes through and painstakingly lists every Infinity Stone. You’d have been forgiven for glossing over this piece of exposition – but Second Son had no such plans. When the Power Stone is mentioned, as you can see in the video above, a certain face is seen wincing in anguish. That face, remarkably, harkens back to a 1997 comic showing the origins of the world eater, Galactus. The theory goes, that we’re seeing the birth of Galactus in the MCU and, presumably, he’s still out there somewhere. Once Galen of the planet Taa, Galactus was born after the merging of Galen and the Sentience. While Guardians of the Galaxy’s Power Stone story doesn’t quite go along those lines, it definitely lines up pretty significantly – including the spectre that once held the purple-hued power source resembling Galactus’ helmet. So, is this the big find we’ve all been waiting for? Honestly, I think so. That comic book panel is just too similar to be anything other than a direct nod but there’s the small matter of the character still having its movie rights owned by Fox. It could be the cheekiest of teases from James Gunn – and we won’t know until he confirms it as such – but, for now, this is both as close to a Fox/Marvel crossover as we’re getting, and possibly confirmation of one of the best Marvel Easter eggs in movie history. Need a primer on the Power Stone and all the rest of it? Be sure to read our definitive guide to the Infinity Stones!